Hello! This is the card I have on the Really Reasonable Ribbon Blog today. 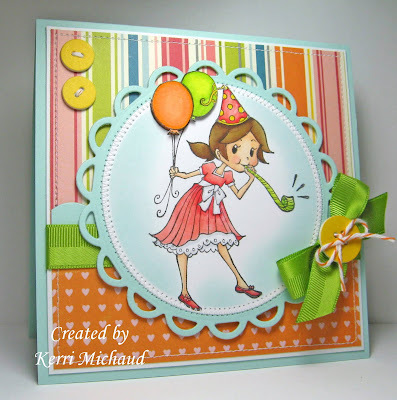 I have been wanting to ink up this adorable image from Sparkle Creations Rubber Stamps called Celebrating Chloe. Isn't she so cute? I found some fun, colorful papers in my stash~a combination of Echo Park Paper Co. Little Girl and Cosmo Cricket Cherry Hill. This Satin/Grosgrain Double Band Celery Ribbon from May Arts goes perfectly with my colors and I tied my handmade buttons with some Orange Baker's Twine. This is also for this week's Sparkle Creations Rubber Stamps Challenge #39~Make Your Own Handmade Embellishment. I made the buttons using my PTI Button Die, and some dp. I hope you have a wonderful Easter tomorrow! We're off to an egg hunt this morning so the kids are really excited:) Thank you so much for stopping by and have a wonderful Saturday! The colors just yell my name! LOL. Absolutely adorable. Have a blessed Easter! Wow Girl!! Your cards are always over the top gorgeous with your stunning choices of paper, colors, and awesome coloring. Too cute gf!! Have a blessed Easter my friend! Love the popped up balloons! Awesome card! 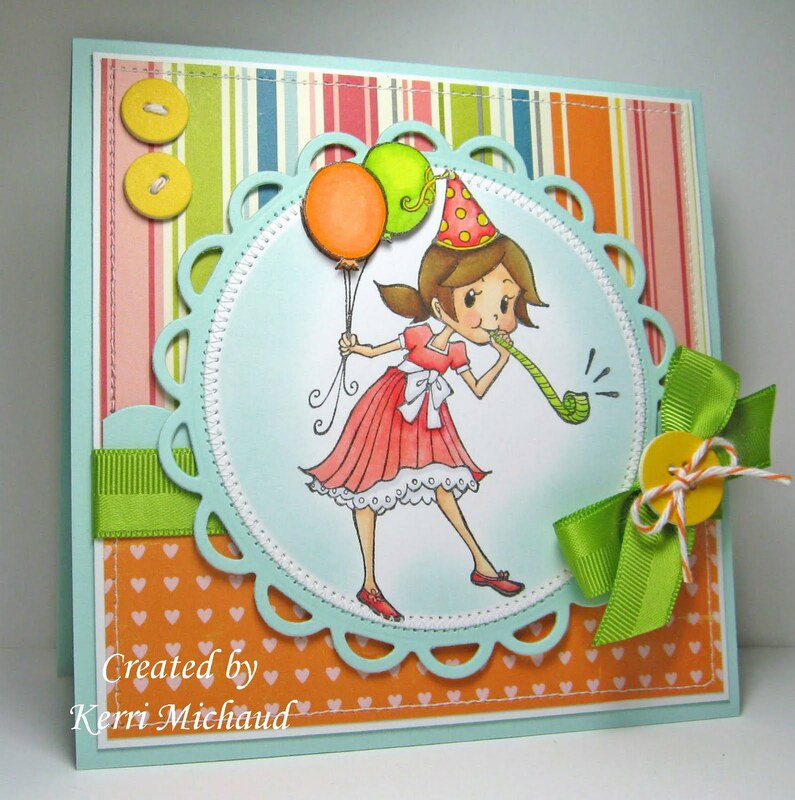 Fun, cute and perfect birthday card. I like the pictures of the kids, they look like they had a great Easter.